Senior Fake News correspondent Frank Rarely discusses the opportunities for populists and masochists alike to join Pauline. 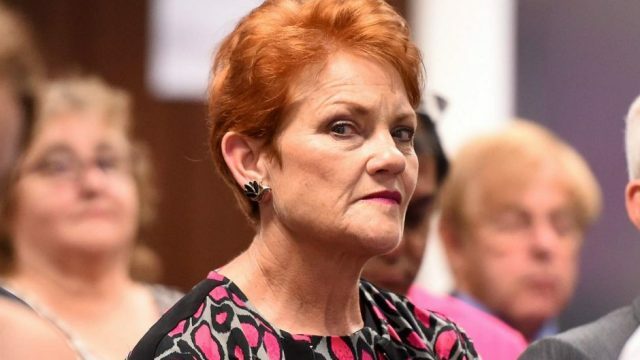 One Nation is urgently seeking men and women who are capable of joining Pauline in parliament at the next election. Such candidates don’t come along all that often and indeed there’s even a concern they might soon become extinct. These singular men and women must share an absolute conviction that the solution to all problems besetting the world is a total ban on anyone leaving their home country. This bold One Nation policy would put an end to refugees, terrorism, multiculturalism, racism, tourism, people smugglers, dual citizen MPs, carbon emissions from planes and reinforce the most attractive aspect of Trump’s isolationist policy by ensuring he never leaves the US. Anyone who fits that profile should either immediately contact Pauline or undergo tests for cognitive impairment. A decision to stand as a candidate for One Nation however should not be taken lightly despite the fact that Cory Bernardi and Mark Latham knocked back the opportunity because they both wanted to continue going to Bali for their winter holidays. By far the greater challenge however is the difficulty in finding anyone who can work with Pauline in Parliament for more than a year. A desperate search is on for very special people who could work with her in absolute harmony. Psychologists believe they possess a rare combination of attributes like the hide of Clive Palmer – no interest whatsoever in politics, no concept of logic and no understanding that these are all handicaps. It is true that a person was once located who possessed all those qualities in abundance but rather than joining One Nation he became US President. Other qualities that could help in the quest to become a One Nation candidate for federal parliament are experience as a guard on Manus Island, membership of the Steve Bannon fan club and being able to quote Joh Bjelke Petersen’s most famous sayings with no hint whatsoever of political incorrectness. It is of course mandatory that One Nation candidates are committed populists and believe that anyone would be better at running a country than politicians despite the clear evidence to date that populists are even worse at it. It is interesting to make a comparison between two of Australia’s leading populists, Pauline and Sally McManus. If Pauline became Prime Minister she’d ensure that money could only be received from commercial organisations for doing work and only by Australians. If the ACTU gained power Sally would appoint John Setka as Prime Minister and ensure that everyone is paid exactly the same amount by the government irrespective of whether they work or live in a mansion overlooking Sydney Harbour. If you’re a true populist your options for a career in parliament are clear. You can either steer clear of politics altogether by joining Pauline or join the CFMMEU, serve an apprenticeship in head-kicking and then becoming another ACTU mole in the parliamentary Labor Party.